I tried this time, I really did. I really tried to like you this time and learn to live with your foibles but I just don’t think we’re meant for each other. It’s not you, it’s me — I’m old and inflexible and I’ve got used to doing things done a certain way. This time I think it’s really goodbye. I’ve used Apple’s photo management software, Aperture, since it was first released and have previously written about why I stuck with Aperture despite how much better the Raw images produced by Lightroom are. A few months ago I decided that the start of 2012 would be a good time to bite the bullet and really switch from Aperture to Adobe’s alternative Lightroom. I’ve felt for some time that Aperture is now being developed more slowly than Lightroom, and don’t see this situation changing in the near future. Encoding photographs involves a round trip through a third-party application such as HoudahGeo rather than being integrated into the application. I like adding GPS data to photographs as a record of where they were taken and any barriers to this are frustrating. 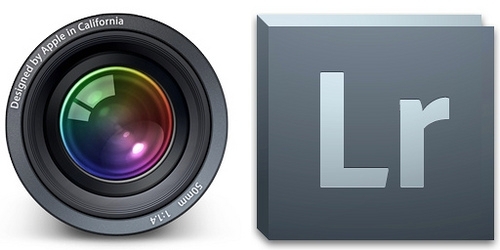 Publishing data to sites such as Flickr or Twitter was more involved in Lightroom. Both applications are best using third party plugins to achieve these exports — Connected Flow’s FlickrExport for Aperture and Jeffrey Friedl’s ’Export to Flickr’ Lightroom Plugin. The plugins for Aperture make it easier to change settings on-the-fly where those for Lightroom rely on settings within publishing services and creating collections for each configuration. At the end of the day these reasons have little to do with the image quality or speed of operation and it may simply be that I am too familiar with Aperture to change my ways. There’s every chance I could be proved right about the pace of Apple’s development and Lightroom is a better long-term bet but I’m happy where I am for the moment. Edit: Almost as soon as I posted this, Adobe released Lightroom 4.0 in beta and this appears to address some of these issues in that it includes a new Google Maps module to support GPS encoding integrated within the application. I’ve also noted that it’s worth looking at the intervals (in months) between major and minor versions for the two applications. While both have been significantly updated approximately every two years, Lightroom has been updated far more frequently and regularly. 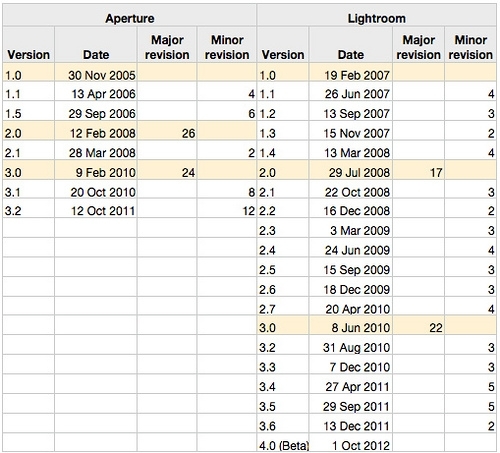 This does appear to back up my premise that the pace of Aperture’s development is slowing down.